If you love making beaded handmade jewelry you can use these same skills to fashion beautiful Christmas ornaments. These projects are also great for beginners, as they use simple techniques and easy-to-find supplies. Making handmade ornaments can be the start of a fun family tradition; choose different instructions for beading Christmas ornaments each year, you'll soon have a tree that's filled with happy memories of Christmases past. All three of these projects are fast, easy, and appropriate for all skill levels. This funky candy cane will add a contemporary touch to your Christmas tree. It's also great for using up leftover beads from previous jewelry projects. Cut a four inch piece of wire and make a small loop on one end. 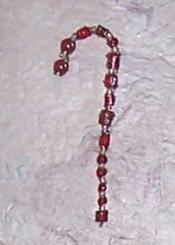 String the beads in a pleasing pattern, alternating red and clear beads. Make a loop at the end of the wire and bend it into a candy cane shape. Cut an eight inch piece of wire to wrap around the ornament for added stability. 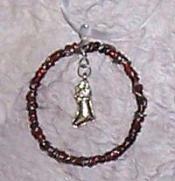 Tiny seed beads and a pretty Christmas charm make this simple ornament a fun holiday project. Cut a five inch piece of wire and make a small loop on one end. String the seed beads along the length of the wire. Make a loop at the end of the wire and twist the two ends together to form a circle. Cut a ten inch piece of wire to wrap around the ornament for added stability. Use the jump ring to attach the charm to the middle of the ornament. A simple beaded ornament can be completed in 10 minutes or less, making this a great project for busy crafters or those in need of a quick homemade gift idea. Cut length of wire slightly longer than you want your ornament to be. Bend one end of the wire into a small loop. Attach the charm with the jump ring to the loop. 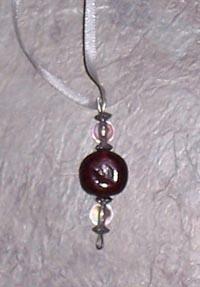 String your beads onto the wire, centering the focal point bead. Use your pliers to make a loop at the top of your ornament. Tie ribbon through the top so you can hang your ornament from the tree. Depending upon the size of beads you use, you may be able to vary this basic ornament design by suspending your beaded dangle in a clear glass ornament ball. 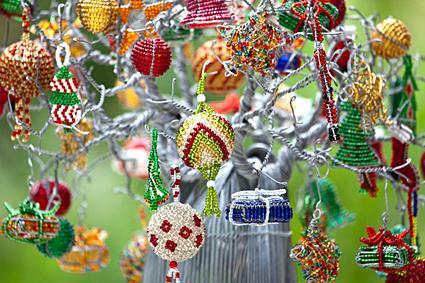 As you grow comfortable with the techniques used in creating beaded ornaments, consider branching out and making ornaments for friends and family as well. You may find that creating some unique ornaments each year becomes a new holiday tradition.